A native of Asheville, North Carolina, Dan Satterwhite enjoys a versatile career. As an orchestral bass trombonist, he has held positions with the the Orquesta Sinfonica de Asturias in Spain and the Orquesta Filarmonica de Santiago, where he was a founding member of Chile’s first large brass ensemble, Philharmonic Brass. Dan was a member of the internationally-renowned Dallas Brass for six years, during which he performed hundreds of concerts throughout the United States and appeared as a featured soloist with numerous orchestras, including the Cincinnati Pops, Florida Philharmonic and the New York Pops in Carnegie Hall. At home in diverse performing situations, Dan has performed and recorded on bass trombone, euphonium, cimbasso and tuba with such organizations as the Chicago Symphony Orchestra, Metropolitan Opera, New York City Opera, American Ballet Theater, the Radio City Music Hall Orchestra, the Gramercy Brass Band, the Dallas Cowboys Band and the orchestras of more than a dozen New York Broadway productions, including “Les Miserables,” “Phantom of the Opera,” “The Lion King” and The Producers.” He was a winner of the International Trombone Association's Donald Yaxley Bass Trombone Solo Competition, appearing as a soloist at the 1984 International Brass Congress in Bloomington, Indiana. Since making South Florida his home in 2001, Dan has been a frequent guest musician with many orchestras, including the Alabama Symphony, Florida Orchestra, Naples Philharmonic, Florida Philharmonic, Jacksonville Symphony, and the Palm Beach Opera Orchestra. As a recording musician, he can be heard with artists from Renee Fleming to Rihanna. He currently serves as bass trombonist of the Florida Grand Opera Orchestra, Boca Symphonia and the Palm Beach Symphony. A lifelong member of the American Federation of Musicians, Dan has served as an Executive Board Member and President and of Local 655, South Florida Musicians Association. 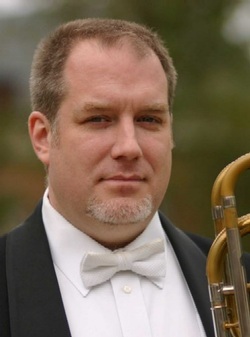 Currently Associate Professor of Trombone at Lynn University Conservatory of Music, Dan has been an adjunct faculty member of the North Texas State University School of Music, Professor of Trombone for the Corporacion Cultural de Santiago, an Artist-in-Residence at the Dreyfoos School of the Arts, and Adjunct Professor of Low Brass at Palm Beach Atlantic University. In addition to his position at Lynn University, he spends his summers in western North Carolina as a member of the artist faculty of Brevard Music Center. Dan earned his Bachelor of Music degree in trombone performance from Mars Hill College and attended graduate school at North Texas State University, where he was inducted into the National Music Honor Society, Pi Kappa Lambda, His teachers include Bruce Bishop, Charles Vernon, Edward Kleinhammer and Arnold Jacobs. Dan Satterwhite is a Yamaha Performing Artist.